Sunday by far has to be my favorite day of the week. Why do you ask? Because Sunday is all about fun, brunching with your friends and loved ones while you overindulge on delicious food and mimosas. I mean Sunday fun-day is truly all about brunching. I have never been one to love breakfast because, for me, variety is a must. You can only do so much with eggs in the morning or in my case, a vegan Shakeology. But when it comes to Sunday brunch, the restaurant scene options are endless, and I am always on the hunt for a great brunch spot or re-enjoying some of my favorite locations. Whether hanging out with friends or my fabulous husband, there’s something about Sunday brunch that always puts a smile on my face. It’s a time to reminisce about the week before or what’s on the docket for the week ahead. There are no true worries ahead, it’s all about taking in the moment and relaxing. I mean isn’t relaxing what Sunday’s were meant for? 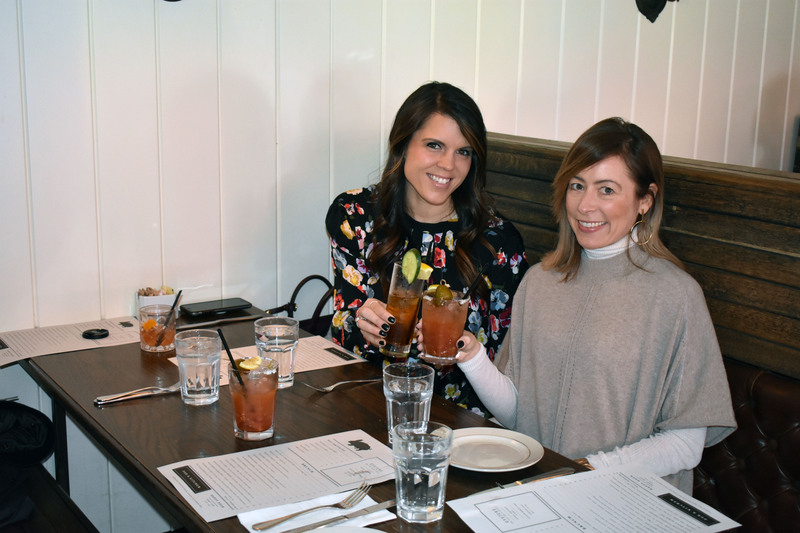 With that being said, I have rounded up some of my favorite brunch spots I have experienced this year in Philadelphia. Wow! By far my favorite brunch spot thus far. I have been to Harp & Crown for dinner and happy hour, but never for brunch. My friend Maggie took me there for it was amazing. At first glance, I was a little hesitant as buffets are not really my thing, but I gave it a go and I am so glad I did. The buffet spread was unbelievable and extremely delicious. You had everything from to-order omelets, waffles, fresh fruit, potatoes, meats, fresh salad, chicken salad, pasta salad, shrimp, curried ham, bagels, sandwiches and more. And their desserts…mouthwatering! They have homemade donuts with all the fixings. The price is under $30 per person and they have drink packages that are hard to pass up. The atmosphere is unique and charming. They have the most attentive staff that always makes sure you are taken care of. First, you can’t go wrong with Parc, no matter what the occasion. The food, staff and atmosphere are like nothing anywhere else. Think of Parc as if Paris came to Philadelphia. You have the selection of dining indoors or outdoors. It’s a great spot to get lost while people watching all while enjoying delicious cuisine. You will always have an incredible experience and I (and my husband) cannot recommend this restaurant enough. For brunch, I’ll either get two eggs any style or the avocado toast, but mostly my go to is the Warm Shrimp Salad with no cheese. No matter what, nothing on this menu will disappoint. From my previous blog: Triple Threat in Philadelphia I blogged about my favorite vegan restaurants in Philadelphia (V Street, Wiz Kid and Vedge) and not only are they by far my go-to spots for lunch/dinner, they hit a home run again with their brunch menu. When I go, here is what I order: Langos Brunch Bun (UNBELIEVABLY delicious), Peruvian Home Fries and the Dan Dan noodles. I am a creature of habit and I have no shame in that. If you had to try one thing during their brunch time, it would have to be Langos. I was never a fan of beets until I devoured this dish. The smoked beets, fried capers, cucumber and sauerkraut remoulade together are a perfect combination. Unlike their lunch and dinner menu, I have yet to try everything on their brunch menu, but why branch away when these three options are a true home run?! Perfect brunch that is a BYOB! A large, varied menu with options for everyone. They have three Center City locations, small, but packed with a lot of people. Even with the crowds, it makes for an exciting brunch. I don’t believe they follow any sort of portion control, as each plate is enormous. But you cannot beat the price and with it being BYOB, it’s a win/win. They don’t take pre-reservations, you have to put your name on the list and wait your turn. Yes, there’s always a line, but be patient, it might take some time to get seated, but it’s worth the wait. Be sure to come hungry as you won’t be disappointed. A cozy, quaint Philadelphia spot right off 19th and Chestnut. Hard to find but once you arrive, you are blown away. They have a great selection that won’t disappoint. When you go, be sure to order the crispy potatoes: garlic aioli. They are out of this world. My favorite has to be the poached eggs: sautéed kale: hollandaise: potatoes. They have their own hot sauce on the side that gives it an extra kick. Even with the recent news of the owners splitting up, I still will mention this spot as one of my favorites. Talk about gigantic portions! That is what I feel Green Eggs Café should rename themselves. Whenever a guest comes to stay, I take them to Green Eggs Café (that is if we can get in). The line is always down the block but another spot that is worth the wait. My dish of choice is the breakfast burrito (minus the cheese, sour cream, and pork) but I do add extra sauce. That sauce by the way, is amazing and if I could, I would eat that every day. Their portions are so huge, this breakfast burrito will last me a couple of days. Any of the French toast is worth it as well. I always get either the pancakes or French toast to share for the table. A little something extra. They do not take reservations; they are cash only and a BYOB. Pub & Kitchen takes day drinking to my kind of level with their New Orleans inspired Pimm’s Cup NO 1! By far one of my favorite drinks of all time. It’s my go-to drink whenever a restaurant has it on the menu. Pub & Kitchen has a variety of options on their brunch menu, which does change based on what’s in season. Some of my favorites are the classic breakfast pizza (minus the chorizo), brussels sprouts and their signature salad. All choices are fiercely delicious. I also love their french fries with the whiskey dip…mouthwatering actually. Their location is on a super cozy corner of 20th and Lombard Street in the Graduate Hospital area of Philly. I love dining here for brunch and dinner. Definitely, put them on your list and start your dining experience with a Pimm’s Cup NO1! One thing that I love about Philadelphia is that our options are endless when it comes to great brunch spots. I haven’t tried them all, but I am on a mission to do so. Sunday brunching is my favorite past time and if you have a particular brunch spot you love, please share and tell me what your favorite dishes are. Cheers! Thanks for all the recommendations! Can’t wait to try some of these places. Sabrinas will always be one of my favorites!